Vintage From Paul is very pleased to offer these stunning Vista Alegre Nautical Salad Dessert Plates. The Vista Alegre Nautical Salad Dessert Plates appear to have never been used. 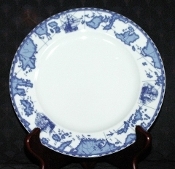 The Vista Alegre Nautical Salad Dessert Plates measure a generous 8-3/8 inches in diameter. The Vista Alegre Nautical Salad Dessert Plates are hallmarked with the Vista Alegre logo and "Vista Alegre Portugal Hotel".